It was just another day at the office for the Dubai Dragons. After four consecutive flags and victories over every team over those years, a trip down to Abu Dhabi did not hold any fear for the Dragons. All they had to do was play their normal way and win. By half time, that was exactly the way things were. The Dragons scoring when they needed to and their defence keeping the Falcons goalless. By the main break, the Dragons had strolled to a 28-point lead and another by-the-numbers half would see them comfortably home. But for any Marvel Studios Avengers fans, the Abu Dhabi Falcons were Bruce Banner. Something upset them at the break and they came out swinging – though not green – in the third quarter. They won the quarter, not by much, and said to the Dragons that pressure was the name of the game. Unrelenting pressure – the kind that wins matches. The final quarter saw the Falcons in full flight. They threw everything at the Dragons and slammed on five goals in a massive comeback. Their game of turning the Dragons’ game around and squeezing them for every possession worked. By the end of the match, Zac Moon had the chance to steal the match on the siren. But the Falcon champ – who had kicked four goals in the second half already – just couldn’t land the killer blow and the Dragons lived. Their two-point win as lucky as they come. So, on paper, the Dragons have won two from two – the Falcons lost two from two. But that does not in any way tell the true story. The Falcons have just announced to all teams that unrelenting pressure makes the Dragons vulnerable. As Leigh Matthews (and big Arnie before him) said in 2001: “…if it bleeds we can kill it”. The Dragons can be brought down. In the other match yesterday, the Multiplex Bulls bounced back hard after their first round loss to the Dragons by outclassing The Entertainer Dubai Dingoes. This wasn’t a hiding, nor was it a runaway win. It was just a solid four quarter effort where the Bulls increased their lead at every break to run out 49 point winners. The Dingoes will be disappointed, having been keen to gain back-to-back victories. However, the Bulls had a point to prove and needed to stay in touch with the Dragons. The ladder now sees the Dragons on top undefeated ahead of the Bulls and Dingoes with the unlucky Falcons winless on the bottom. But things can change quickly. 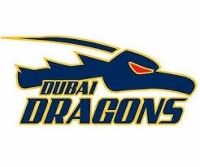 The next round on December 7th will see the Dragons and Dingoes in the local Dubai derby. The Falcons have another chance to cause an upset when they host the Bulls.